All of the DJs featured below cover Liverpool, Blundellsands, Brighton-le-Sands, Crosby, Little Crosby, Thornton, Sefton, so why not take a look through to find one that takes your fancy, OR request quotes from ALL available local DJs with one simple form by clicking HERE. There&apos;s no obligation to book and all quotes are FREE of charge! 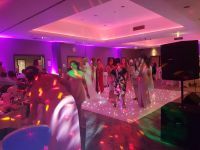 The biggest deciding factor in ensuring the quality of the DJ service that you hire in Liverpool, Blundellsands, Brighton-le-Sands, Crosby, Little Crosby, Thornton, Sefton is usually the budget. We urge you to consider this very carefully as an overall percentage of the cost of your event. Don't shop for a DJ in Liverpool purely on price, because many affordable yet experienced DJs will actively avoid clients that appear not to value the service and focus only on cost. Instead, shop around on the suitability, reputation and level of service being offered - then, once you have a shortlist of suitable DJs you can then review the pricing. The map below shows local party venues in Liverpool L23.